When I started dating Romeo*, he was charming, thoughtful, and sweet. I easily fell for him. But as the months went by, I started seeing beyond his smooth-talking demeanor. My gut told me something was wrong. What started out as confidence soon became cockiness. Some of his quips were off, and sometimes it embarrassed me. I started keeping him from my friends. Some of them met him only once; others never met him at all. I realized I should’ve involved my friends early on, if only to hit my head on the wall. Romeo was jealous of many things—my volunteer work, my dogs, and even my best friend *Mark who passed away years before. Romeo had anger management issues. He often got into toxic arguments with friends. He would keep yakking to me about unsettled altercations he had—whether it was recent or something that happened years ago. I told him that his attitude turned me off—like how he wished death and illness upon his enemies and ex-girlfriends. His was like Jekyll and Hyde. Some days he was the sweetest boyfriend; other times he was Mr. Negatron. I was confused. I see myself as an empowered woman, but with him I was a different person. I was always confused, crying, and second-guessing myself. I finally opened up to one of my friends, Janna*, a psychology student. She explained the characteristics of a narcissist, and Romeo ticked everything off the list. He was emotionally abusive, and his method was gaslighting. After 10 months, I finally broke up with Romeo. I thought I was free, but he got angry and turned things around by telling me that I had so little patience for him, as compared to all the times he had to deal with my issues. Weeks after the breakup, he asked to meet up for coffee, and for the sake of closure, I agreed. He seemed genuinely apologetic, and I accepted it. He wanted to be friends again. I said yes, but emphasized “just friends.” He got mad. He thought I simply needed wooing. That was the start of another toxic cycle. We’d fight over the phone, text, and FB messenger for days, with him repeating the same things over and over again—all his rebuttals against me and why he deserves another chance. He wouldn’t take no for answer. I tried different approaches—serious talks, angry talks, long emails, diplomatic text messages… nothing worked! He would seemingly accept my final decision and not pester me for a while. Then he’d resurface weeks later to ask me out. When I’d reject him, he’d fight me, and then say sorry. This sick cycle went on for months until I finally blocked him from my social media, phone, and Viber. He turned to my sister. Ate Mae* told me that he started texting her, repetitively explaining his side of the story and the things I did wrong. Ate was nice at first, but she got so tired of trying to talk sense into him, so she blocked him as well. I finally had peace and quiet, but not for long. More than one year after the breakup, I started receiving letters and gifts via courier daily. Romeo was trying to woo me back… again. He wrote about how he misses me. “I know you still love me,” one letter said. I cringed. How could I be in love with someone I’ve blocked for over a year? He recounted all the conversations we had. 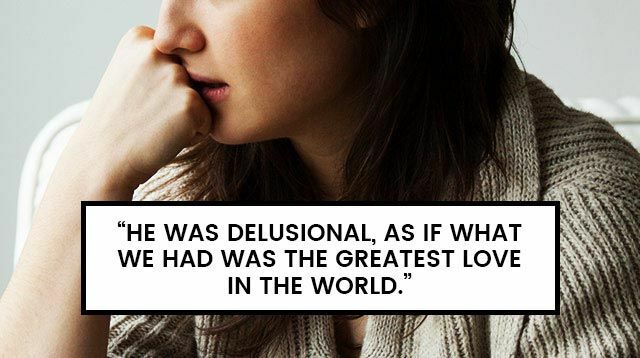 He was delusional, as if what we had was the greatest love in the world. It was so creepy that I didn’t even open most of the packages. They started piling up in a corner. I consulted my psychologist friend. We agreed that the gifts were a form of harassment. It pressured us to be nice and accommodating because he was spending so much money and time on us. I couldn’t see the point of talking to him to re-explain what I said a million times before, so I tried to ignore and pray he’d go away. But he didn’t. I finally opened all the packages that piled up. There were lyrics to love songs, poems, mushy letters, and boxes of presents, like chocolates and trinkets. He also printed out all the messages and photos I sent to his phone years ago. He sent Mommy long messages via Facebook, revealing to her our relationship issues. We thought about returning all the gifts to him, but were afraid it would trigger his anger. I donated them to charity instead. I needed to make him stop without involving lawyers because our families are friends with each other. I approached Arthur*, one of his closest friends. I told him everything. He said he’s not entirely surprised because Romeo has a toxic history with girls. I begged Arthur to tell Romeo to stop. I don’t know how their conversation went, but Arthur assured me that Romeo would stop sending packages thereon. It’s been a year since then and I haven’t heard from Romeo. But whenever the phone rings and the condo guard tells me there’s a delivery, I get so anxious.